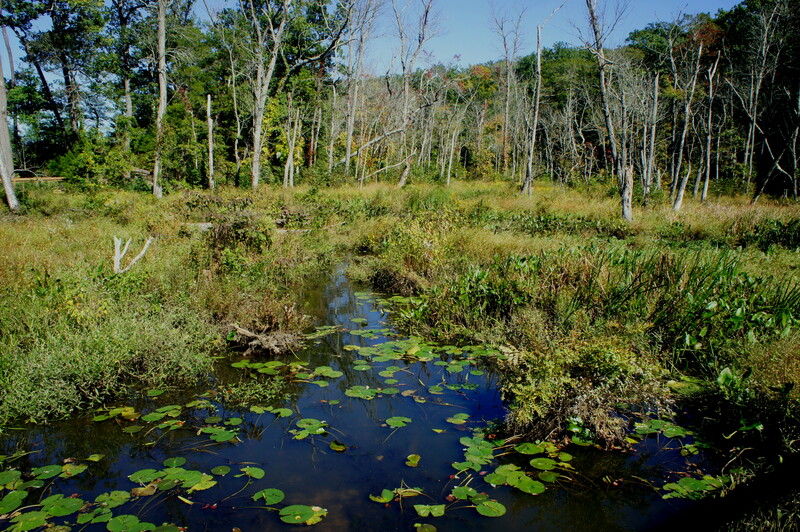 Like most marshy environments, the defining feature of the Mason Neck peninsula is, of course, the water that surrounds it. 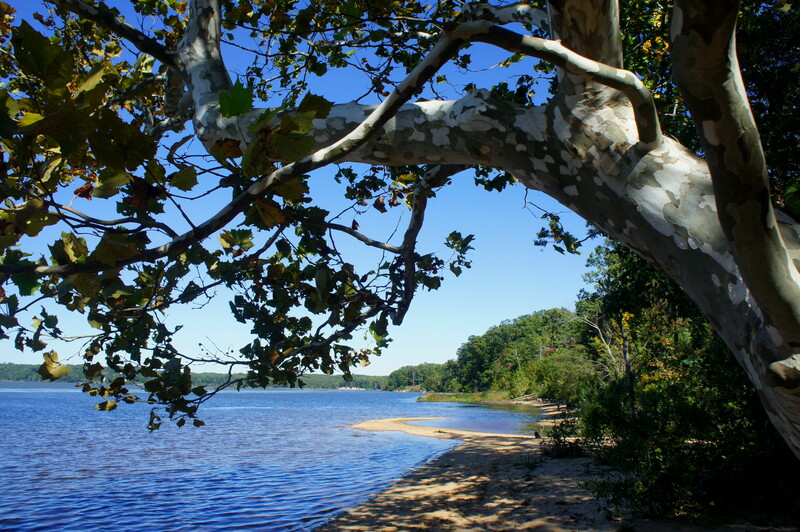 Despite being well upstream of the ocean, the Potomac River at Mason Neck still ebbs and flows with the Atlantic tides, and the inlets of Belmont Bay and Kane’s Creek give life to freshwater wetlands at Mason Neck State Park, Virginia’s closest state park to Washington, DC. Mason Neck’s family-friendly Bay View Trail is probably the park’s most popular hike and weaves in and out of the tidal marshes, providing excellent vantage points for viewing wildlife, including great blue herons, ospreys, a variety of frogs and turtles, and the area’s iconic bald eagles. 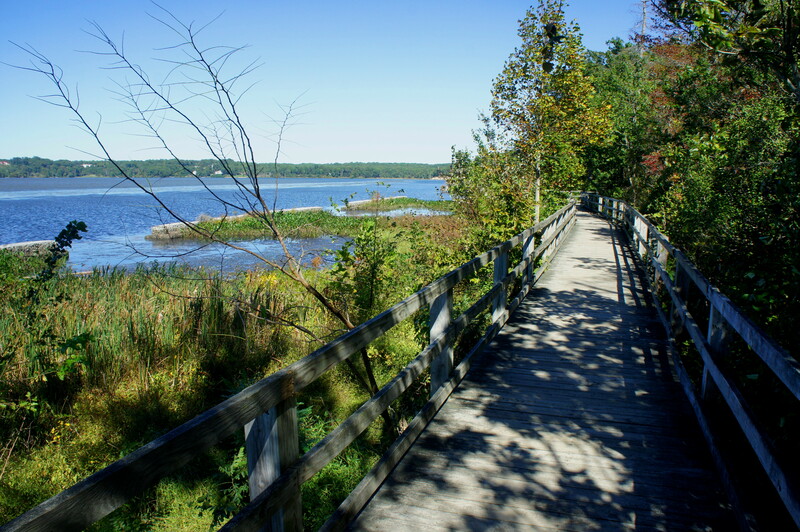 The Bay View Trail—an easy, 1-mile circuit—is accessible from the main picnic area and playground at Mason Neck State Park. (Note: Following the signs for the Visitor Center, take a left just before approaching the center; park in one of the designated areas near the playground.) The well-trodden path is marked with a panoply of signs and trail guides; there is a very good wayside with a color map at the start. Tackling the circuit in a counter-clockwise direction, stay to the right as the trail follows a wooden fence and well-manicured lawn overlooking Belmont Bay. Steps into the hike, pass a large sign denoting Mason Neck’s location on the National Park Service’s “Star-Spangled Banner National Historic Trail,” a tribute to the story of the War of 1812. Mason Neck has weaved in and out of many of the key threads of American history: 17th century exploration, the Revolutionary War, the Civil War, the post WWII boom. In 1608, famed explorer John Smith came ashore here, finding a band of Moyumpse—or Dogue—Indians occupying the area. In the late 1700s, revolutionary patriot George Mason built his home, Gunston Hall, on the peninsula that now bears his name. 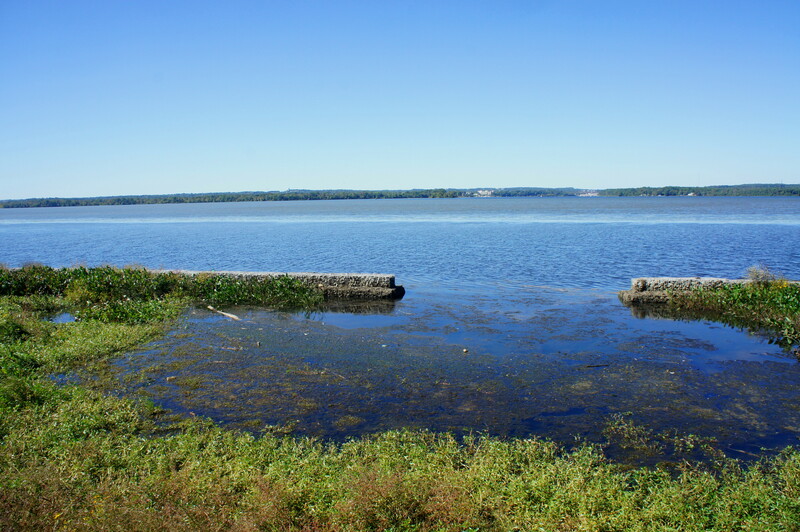 At nearby Gunston Cove, an American gun battery fired on British troops sailing down the Potomac during the War of 1812. Mason Neck was also in the crosshairs of the Civil War, with Union troops seizing the peninsula in 1862 to cut off a supply line for Confederate smugglers. 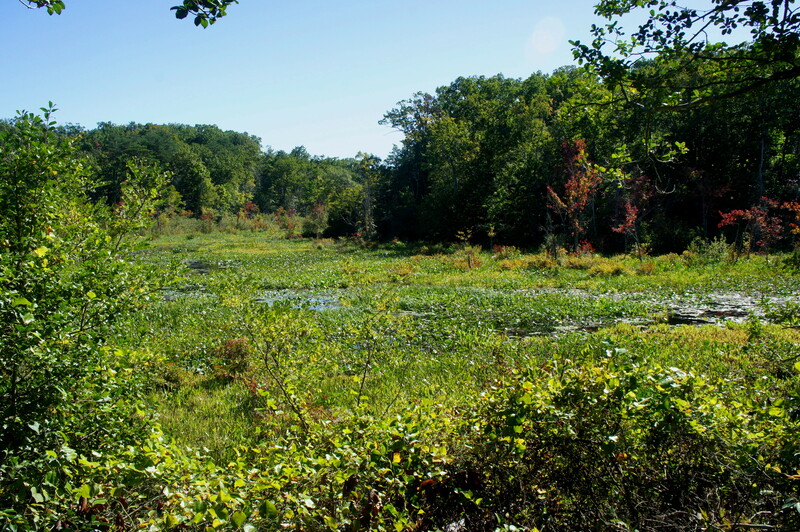 Finally, it became a local standard-bearer for the local environmental movement in the 1960s, as residents like Elizabeth Hartwell (for whom a nearby wildlife refuge is named) lobbied state and federal government to protect the wetlands from encroaching suburban development. Approaching the wetlands, the trail drops down a series of wooden steps and crosses the first of several boardwalks, providing an unvarnished view of Belmont Bay. From here, the trail follows a high bank along the bay with views of bayside cattails and a stony embankment called a gabion basket wall, which protects the shoreline and marsh habitats from erosion and boat wakes. At 1/3 mile, the Bay View Trail descends to cross a small inlet with a beaver dam and passes a sandy spit on the right. 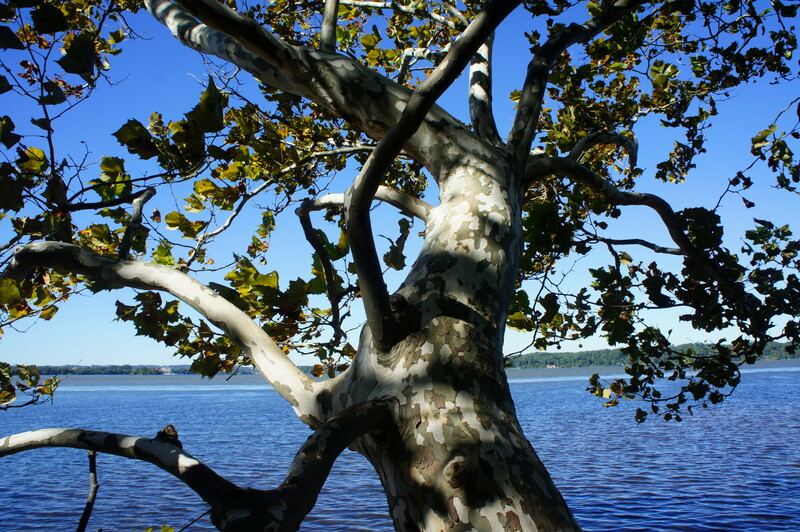 A short spur provides access to the beach, which is towered over by a sycamore tree with beautifully-speckled bark. 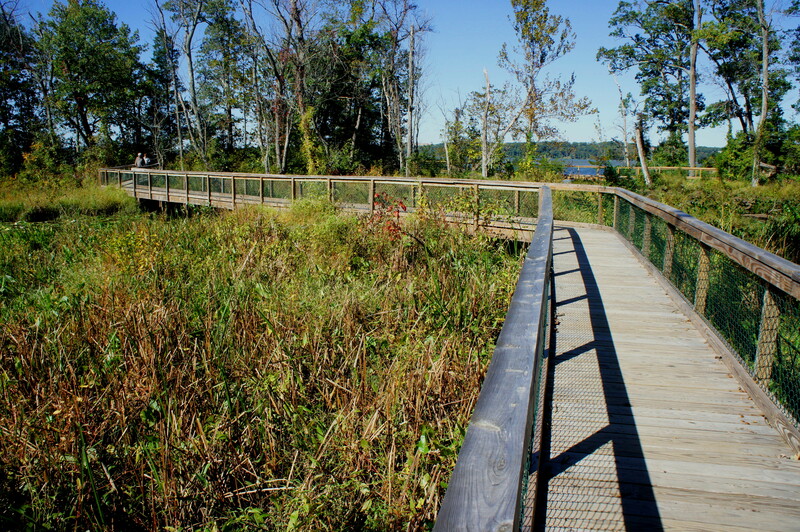 Just beyond, the trail leaves the bayside and darts inland, traversing a lengthy boardwalk over the park’s most impressive freshwater marshes, dotted with low grasses and lily pads. At the far end, hikers will climb a set of stairs, entering the hardwood forest and approaching a trail fork at around 4/10 mile. Stay right at the fork, looping around amid holly, hemlocks, oaks, and mountain laurel to an observation blind at ½ mile. Here the viewpoint provides a distance look at a marshy estuary, a decent place for spotting bird life. 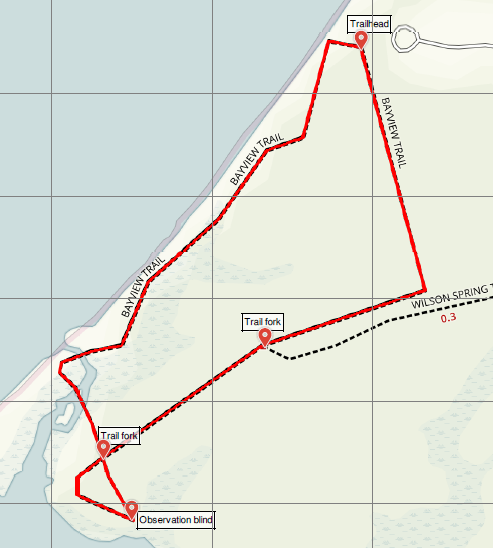 Looping back to the four-way trail junction at 0.54 miles, stay right to complete the circuit. The rest of the trail remains under the shadow of the tree canopy. Stay left at the junction with the Wilson Spring Trail, continuing amid the blueberry bushes toward the picnic area. 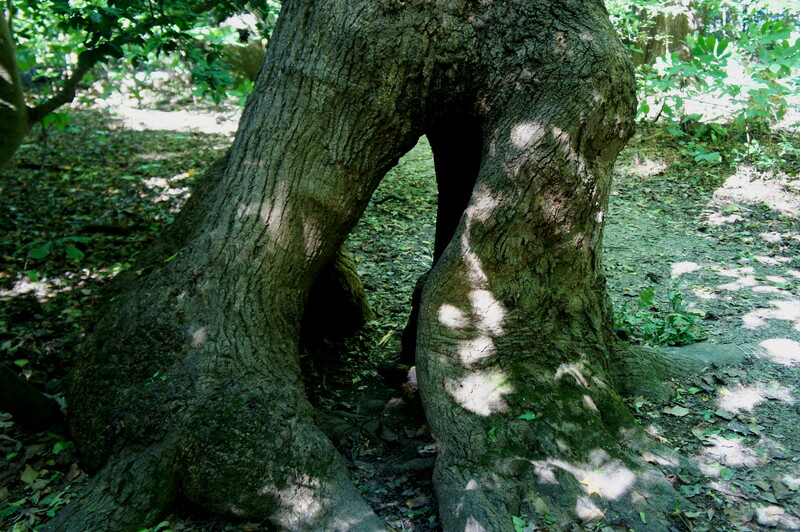 At 8/10 mile, traverse a snaking boardwalk, followed shortly by a peculiar tree on the left with a hollowed-out trunk large enough to crawl through. Finally, at about one mile, the trail emerges from the trees and returns to the picnic area and playground. 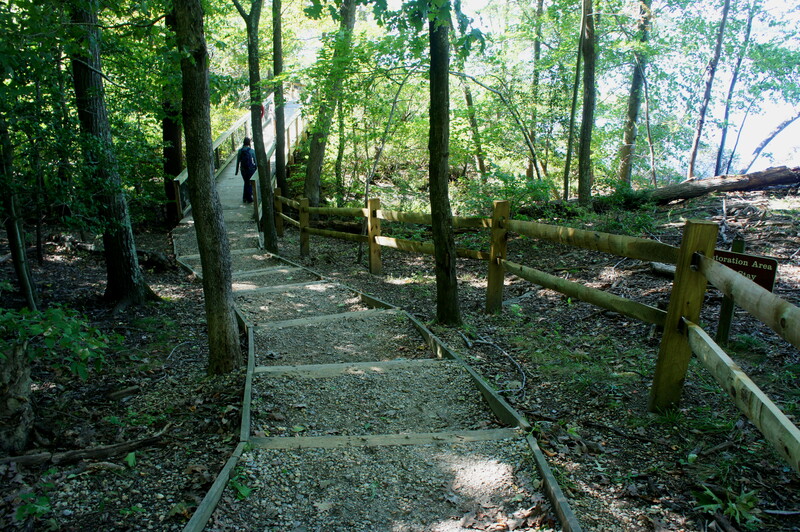 Allot between 30 minutes to an hour for this loop hike, the best in Mason Neck State Park. 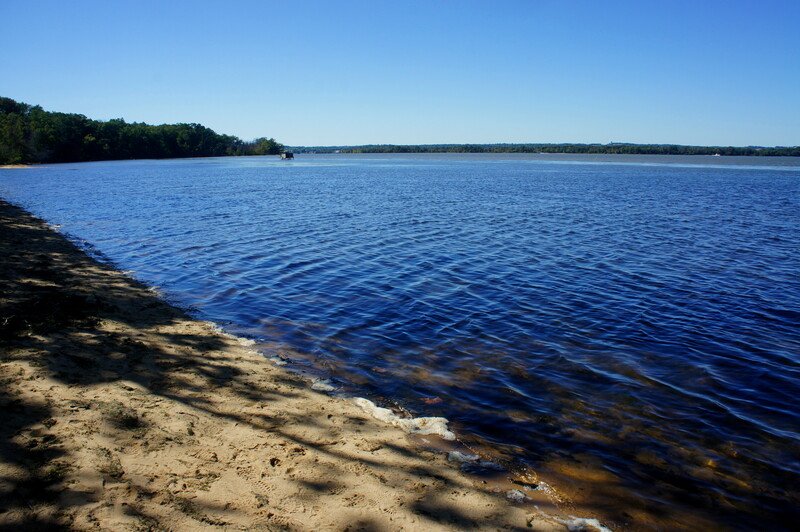 This entry was posted in Mason Neck State Park, Virginia and tagged Bay View Trail, Belmont Bay, Civil War, Fairfax County, loop hike, marsh, Mason Neck, Mason Neck State Park, Potomac River, Star Spangled Banner National Historical Trail, Virginia. Bookmark the permalink.